The Malevich Malady: Black Square Red Zone, The Art of Habit and Addiction (group show), Kallinen Contemporary Art Gallery, Houston, Texas, June 14-28, 2014. 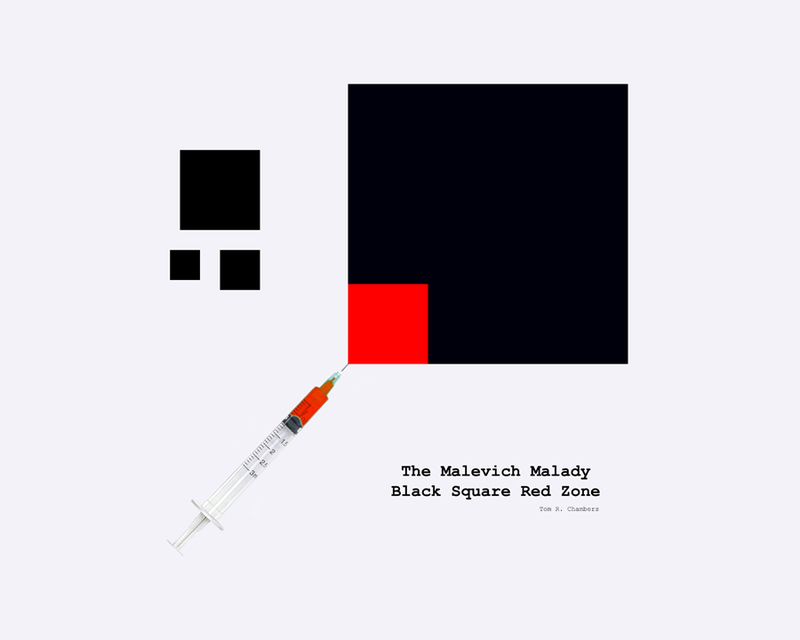 Within the context of this exhibition, Kazimir Malevich's "Black Square" represents humanity, and his "Red Square" represents inflammation or the infusion - via the syringe - of the "addiction". Addiction: a strong and harmful need to regularly have something (such as a drug), or do something (such as gamble). The line between habit and addiction is not clear. Certainly everyone agrees obesity is harmful and the result of years of overeating so if 1/3 of the population is obese, are there 100 million food addicts in America? Tens of millions use nicotine, and over 200 million use caffeine every day. Only 5% of the population exercises at a level which yields the majority of health benefits, and if you don't know an alcoholic or addict, you have been living on Mars. The CDC predicts that a Hispanic female born in 2000 has a 52% chance of getting diabetes - a disease that even with proper medical treatment shortens life by 10 years and a disease caused mainly by bad eating habits. Drug overdoses recently surpassed vehicle accidents as a cause of death. The medical and lost productivity costs of America's habit choices are well over a trillion dollars. "Just Do It!" and "Just Say No!" are not working. Why then despite the overwhelming impact of habit and widespread knowledge of which habits are good and bad do only a few possess the right habits which greatly increase the quality and length of life? Why aren't there more studies on how to adopt good habits, and get rid of bad habits? Good health by behavior change would greatly effect the need for healthcare and other vast empires built on addiction and habit. Harnessing the creative power of dozens of artists, "The Art of Habit and Addiction" is a Kallinen Art Happening and juried competition which explores all aspects of habit and addiction through painting, sculpture, video, music, photography, clothing, and the spoken word. All profits from the show will benefit an addiction treatment facility.